bebop spoken here: CD Review: Jeff Hamilton Trio - Great American Songs through the years. 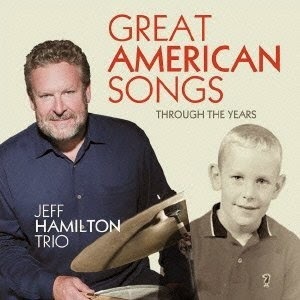 CD Review: Jeff Hamilton Trio - Great American Songs through the years. Tamir Hendelman (pno); Christoph Luty (bs); Jeff Hamilton (dms). Glory be! Hallelujah! A standards album! CD of the month? Surely all bets are now off! Whilst I recognise the need of young players to produce original material which, unfortunately (or in some cases fortunately) will never enter other bands' pads, I do question as to why they think their material is better than that of the Gasbook? Or, come to that, more contemporary composers such as Cohen, King, Mitchell? At the end of the day, a familiar theme is much easier for the jazz newcomer to latch on to. Then, once the head is played, reprised, they are off on solos that the listener can more easily relate to. Great American Songs is a perfect example. Israeli born pianist Hendelman is the kind of player we once took for granted - Peterson, Powell (Bud, Richie, Mel), Previn - and now are delighted to discover in this wonderful reminder of how it used to be, how it should be (and still is on this disc). The progressions, the improvisations, the general feel and the arrangements of these 10 classics is as near perfection as I've heard in many a long playing life. The fact that Jeff Hamilton - the most tasteful drummer ever - is leader of the group will, I'm sure, convince any doubters that this may be the finest jazz piano trio disc since the abdication by death of Oscar Peterson. And, dare I say it? Hendelman displays the one quality Oscar occasionally lacked - restraint! Luty is featured both pizz and arc - in the latter mode he brings an almost cello-like quality to his bowed bass passages - listen to the opening melody of Someone to Watch Over me. A tremendous recording - that's the good news! The bad news is that this Capri release is a limited edition of just 2,500 copies that are available only from Capri or Amazon (unless you have the version released in 2013 in Japan) so don't hang about!. For the record the titles are: Falling in Love With Love; Tenderly; The More I See You; It Could Happen to You; Someone to Watch Over me; Thou Swell; You Took Advantage of me; I Thought About You; All or Nothing at All; How Long Has This Been Going on? The disc sounds wonderful - no luck so far with trying to buy, neither from Amazon nor the Capri sites .... anyone else got lucky? Patti - try new link to Capri at foot of post.